There are many wedding traditions, and each of them includes a designated color or color combination for each anniversary year. 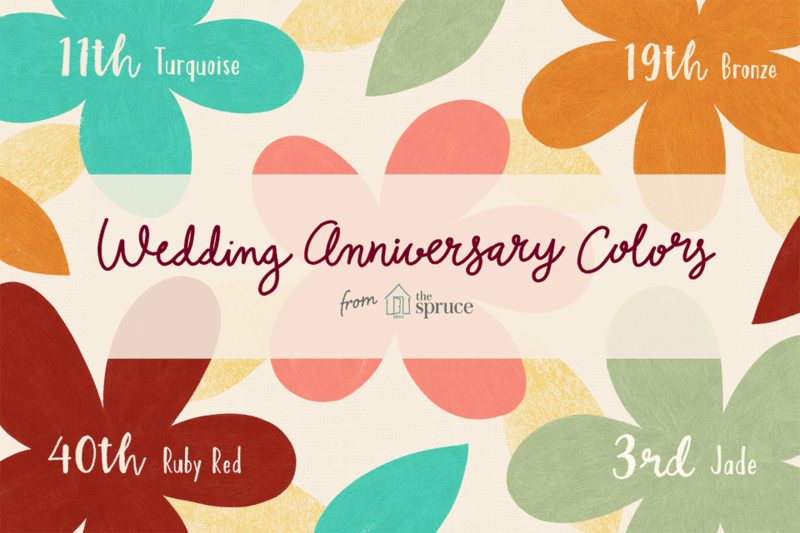 You can draw inspiration from traditional wedding anniversary colors to celebrate your special annual date in style. For instance, your first wedding anniversary colors include gold or yellow. In nice weather you can go out together wearing a happy summer or spring yellow, and at night you can be fashionable with a sleek gold dress or tie. The season when you wed sets the tone for what you can do with the traditional colors given to you. For instance, a mix of pink, red, and vibrant yellow is good for an alfresco summer wedding. You can use this as a jumping point for your anniversary, whether you're going out, planning a party, or gifting each other something that involves the color scheme. For example, your fifth wedding anniversary color is blue. You can spend your time outside in the bright blue sky on beautiful blue water on a good day, or make a movie night with films that have the word "blue" in it. Whatever you do, get creative with your colors and make your annual date fun and modern with a classic twist.